The structure of man can be divided into five material layers enveloping Atman (your indwelling soul). These layers or sheaths enclose you "like the coats of an onion" and are called KOSAS in Sanskrit. The five sheaths may also be classified under three different headings;PHYSICAL body, ASTRAL body and CASUAL body. Your physical body is know as the FOOD SHEATH because it is created, maintained & eventually returns as food. There are five faculties functioning within you. They correspond to the five physiological functions. They are called the five Pranas. Together they constitute thePRANIC SHEATH. They have been given that name because they are related directly to air you breathe. Faculty of perception (prana): is the functioning of the five senses as seeing, hearing, smelling, tasting and touching. Faculty of excretion (apana): throws out, evacuates excreta of the body such as feces, urine, sperms, sputum, perspiration etc. Faculty of digestion (samana): digests food received by the stomach. Faculty of circulation (vyana); distributes digested food to different parts of the body through blood stream. Faculty of thought-absorption (udana): takes in fresh knowledge. Vital-Air sheath is subtler than food sheath. It controls the food sheath. When your pranas function properly your physical body remains healthy and strong. And when they slacken and work inefficiently the body is adversely affected. Your mind is known as theMENTAL SHEATH for it consists of passions and emotions, feelings and impulses. It controlspranic & food sheaths. When the mind is disturbed, the physiological functions (pranas) and the physical body are affected. Your intellect is know as the INTELLECTUAL SHEATH as it is the seat of judgment, decision, directed thinking, reflecting, reasoning, discriminating, judging, etc. It analyses and distinguishes between pairs of opposites. It controls the above three sheaths. 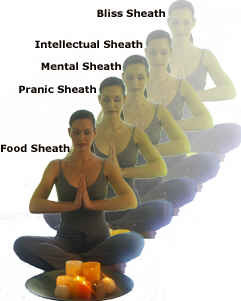 The last but extremely important sheath (5 covering layers of a living being) is the Bliss Sheath. It basically embodies the realization that happiness comes from within and is not dependent on material possessions or physical enjoyment. The Ultimate State of Bliss is a state of eternal silence, wherein we are not troubled by tormenting thoughts & fears and where we are freed from all sorrows. When this sheath is uncovered, not only does the living being come very close to God but that it becomes God Himself.